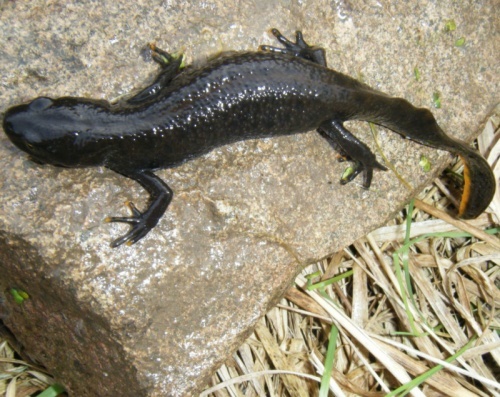 Length: up to 16 cm. 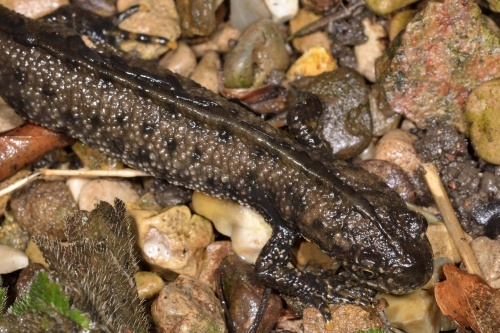 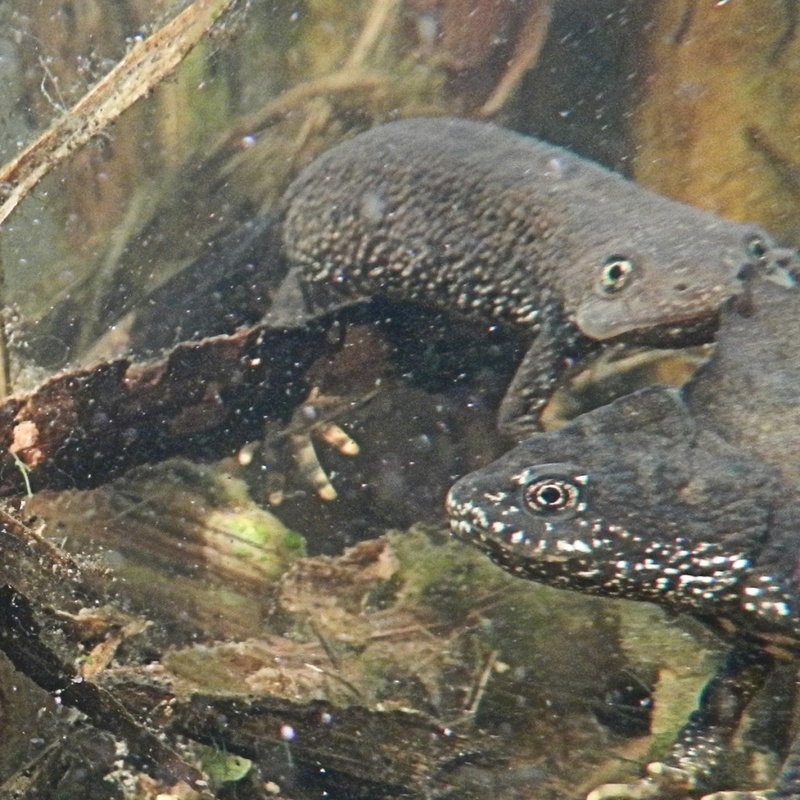 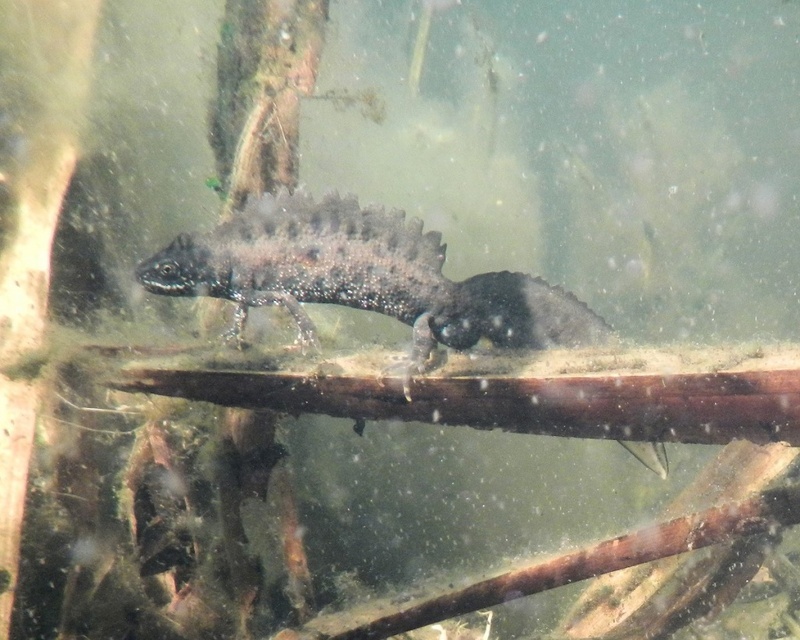 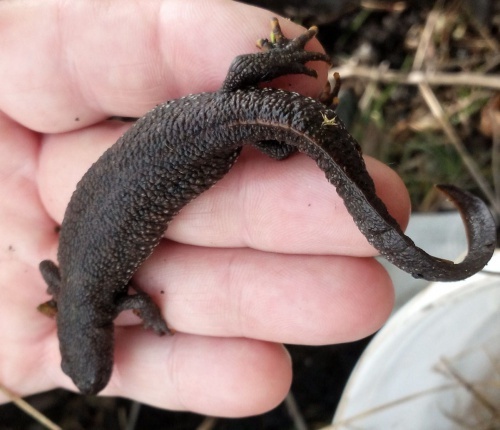 The Great Crested Newt is Britain's largest and most threatened newt. The body is generally dark brown to black in colour with a warty appearance, which gives the species its other common name, the warty newt. 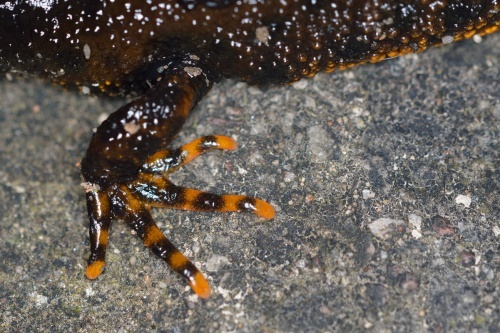 The underside is bright orange with black markings that are unique to each individual. Females tend to be slightly longer than males, and in the breeding season the latter develop an obvious crest between the head and the tail, and a silver streak along the middle of the tail. Outside the breeding season, males and females are fairly similar in appearance, but females always have an orange line on the tail. 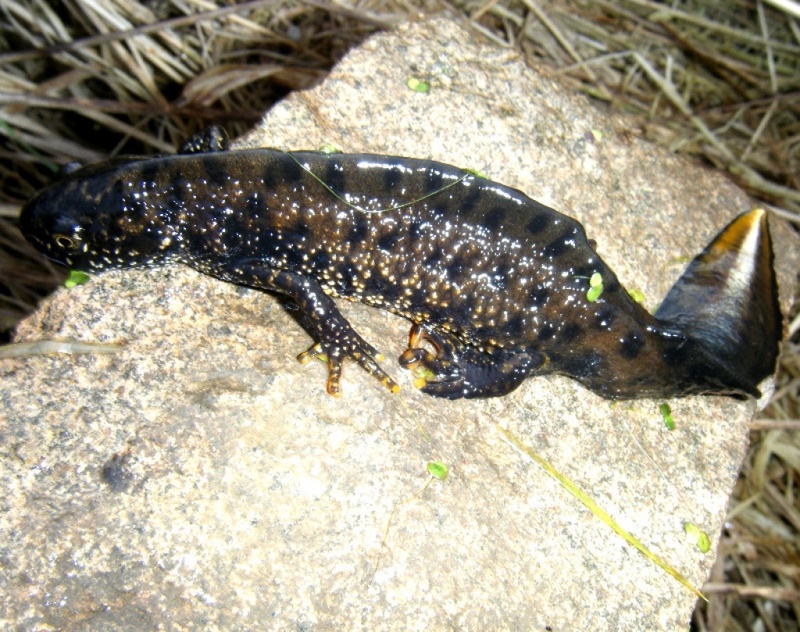 Juveniles generally look like females but may have a yellow stripe along the back. 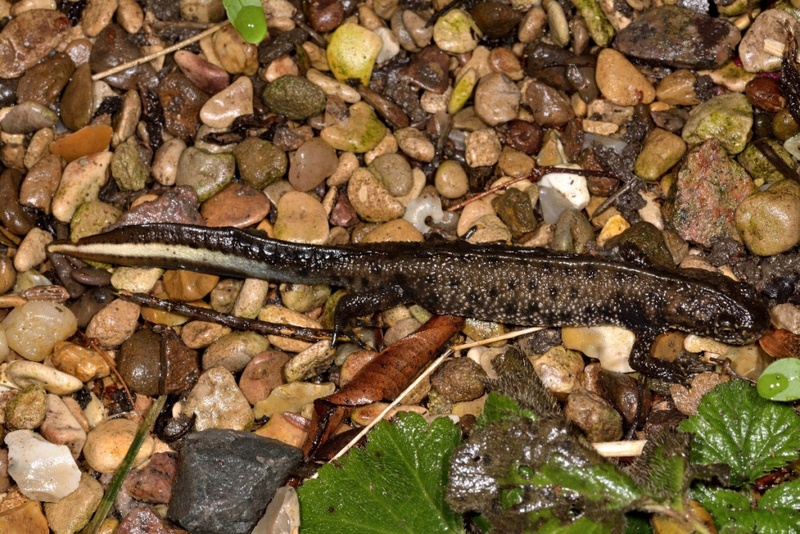 This species inhabits a wide range of habitats, including farmland, woods, grasslands, dunes, quarries, industrial and 'brown-field' sites, within which it favours large ponds with abundant weeds and no fish. Best sought round water from egg laying in February/March until it leaves the water in August/September. 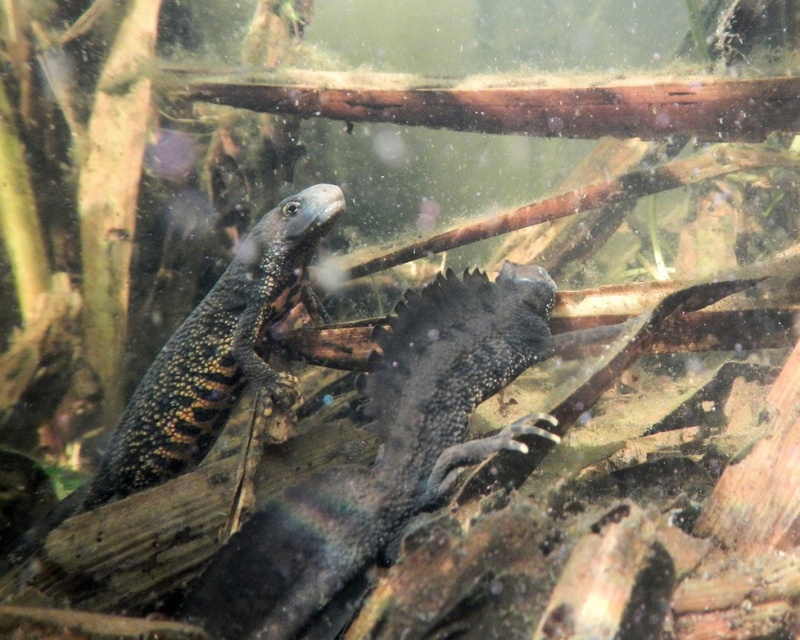 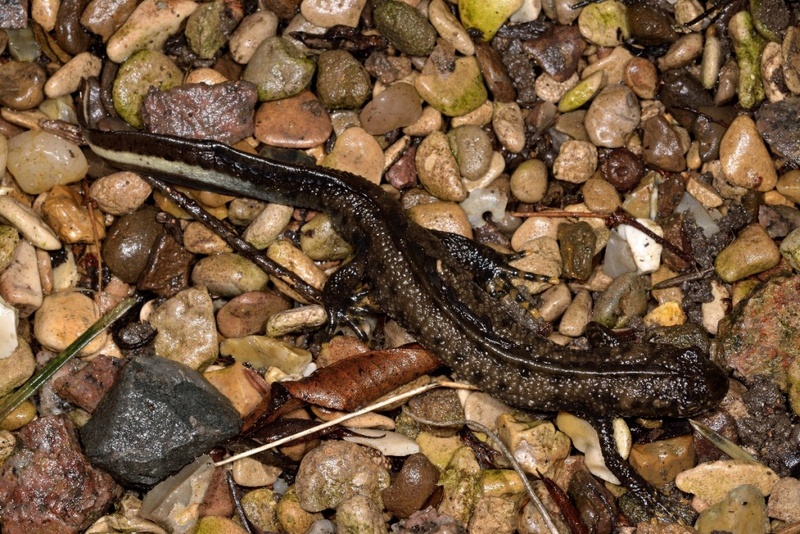 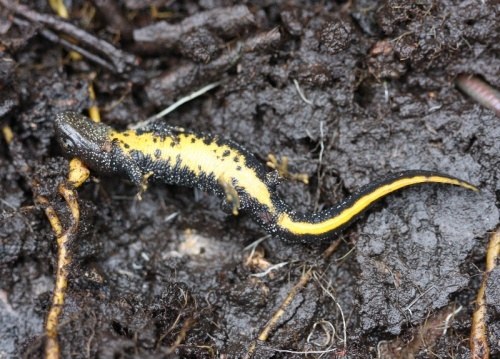 Great Crested Newts feed on a range of aquatic invertebrates, but occasionally tackle large prey items such as adult smooth newts and large dragonflies. 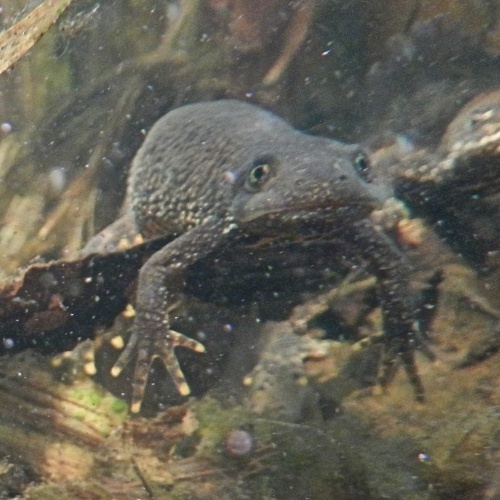 They are mainly active at night, spending the day at the bottom of ponds or hidden in vegetation. 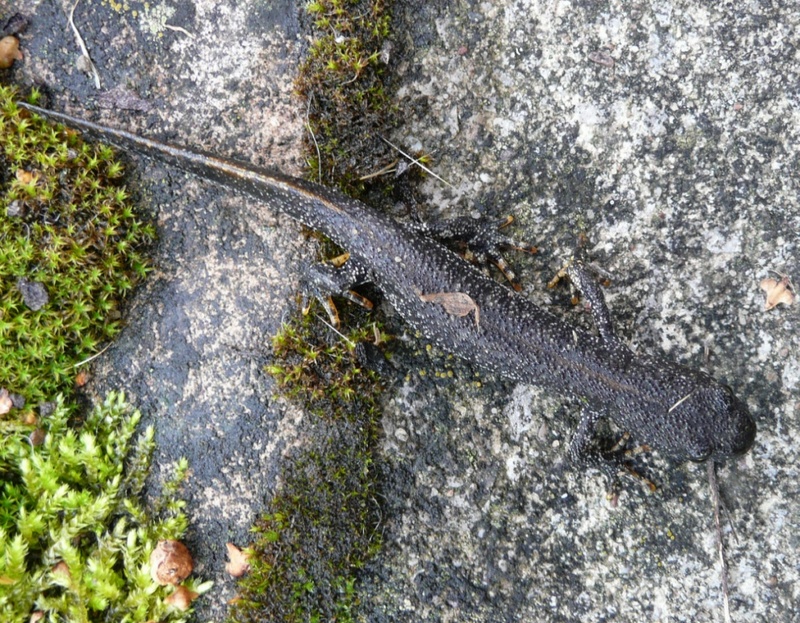 Males have an extravagant display used in courtship, it involves a male standing on his front legs in front of a female with an arched back while he waves his tail around. If the female is receptive the male transfers a spermatophore. 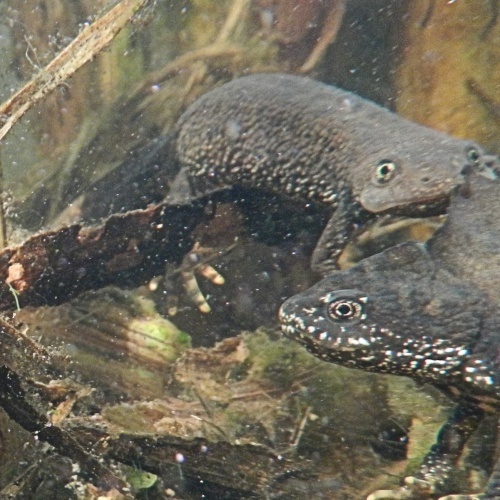 Eggs are laid in February or March. 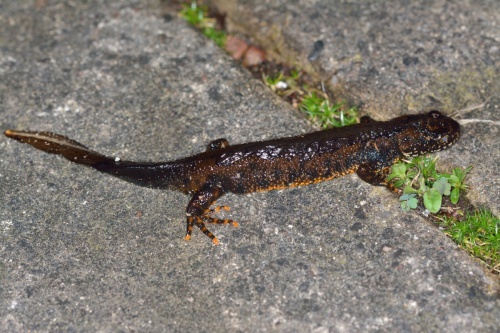 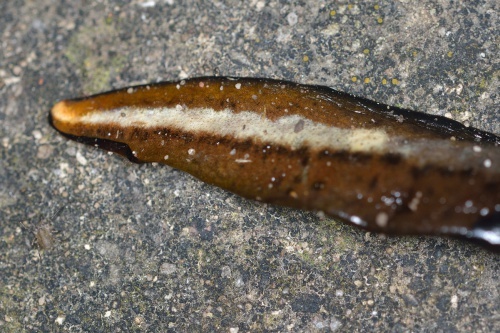 The species has a wide distribution in Britain, but is absent from Cornwall, Devon, and parts of Wales and Scotland and is generally uncommon. 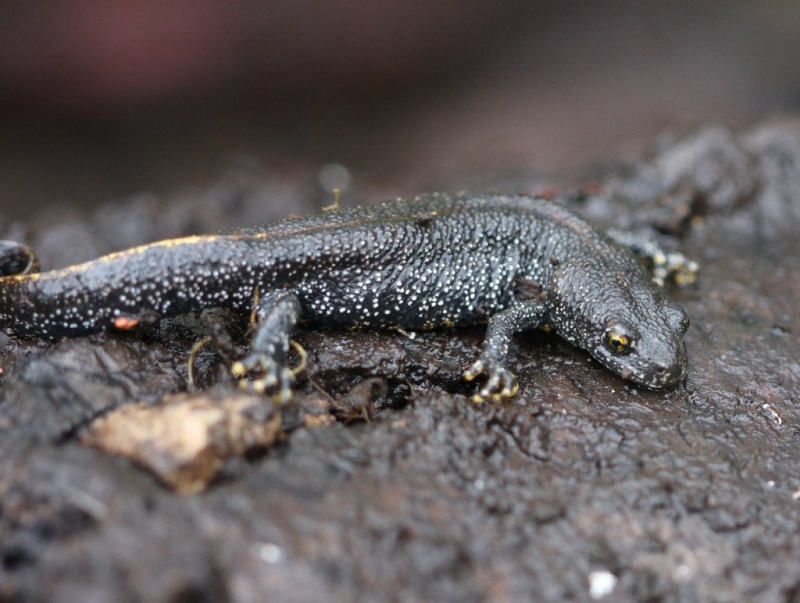 The population has undergone a very severe decline in the last 50 years and is subject to protection.